As life-long residents of Galveston Island, Taylor & Noah didn’t have far to go for a glamorous wedding. The beautiful Conservatory and surrounding grounds of Galveston’s Bryan Museum provided an elegant setting for this young couple. Guests braved chilly temperatures and gusty winds for the traditional afternoon service set in the venue’s formal gardens. Fortunately with proper planning, plenty of mobile heaters provided by Tour de Tents warmed the seated guests, and as a gift from the bride, soft cream-colored shawls were offered to all. During the service, Houston Music Strings provided lovely music to accompany the wedding procession. Noah and his groomsmen were dapperly dressed in black tuxedos, while Taylor’s beautiful dress featured a delicate lace bodice and flowing A-line skirt – She Was Stunning! Her bridesmaids wore backless navy gowns in a vintage hourglass style. 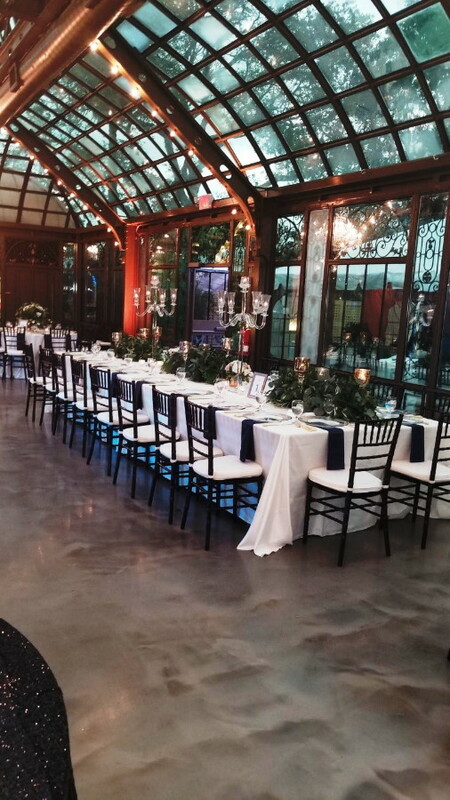 At the conclusion of the service, guests meandered over to the Conservatory’s courtyard for an hour of cocktails and appetizers by Bailey Connor Catering, with live acoustical guitar provided by Avalon Music and Wayne Holt. A Finer Event provided furnishings and Majestic Linens the tablecloths that transformed the courtyard into a lively happy hour setting. Meanwhile, Ryan Jones Photography captured timeless images of the couple’s service and time spent with their family and friends. After introducing the newly married couple, guests were invited to the dining area. Tour de Tents created a large dining space on the pad next to the Conservatory, adorned with a large halo of live greenery hanging from the center of the space. Dining tables were festively set with gold-tone flatware and gold-rimmed chargers provided by Aztec, and guests were served Seared Beef Tenderloin and Maryland-style Crab Cakes, again created by Bailey Connor Catering. In addition to the halo’s greenery, the bouquets, boutonnieres, centerpieces, and other floral accents were provided by Dream Bouquet and featured Queen Anne’s Lace, Blue Thistle, and miniature burgundy Calla Lilies. 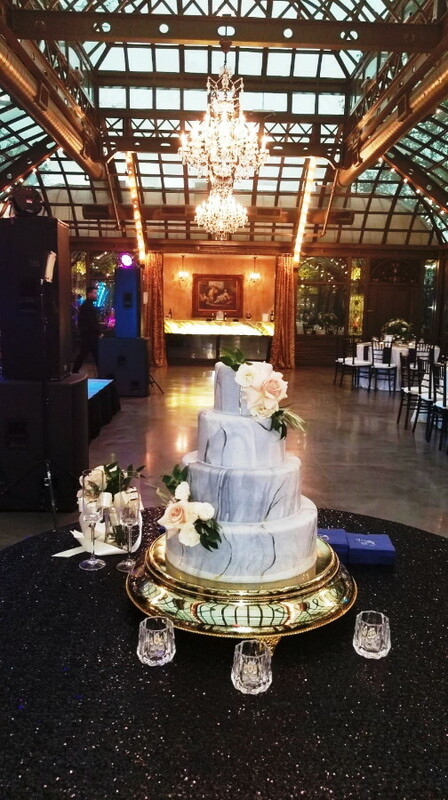 Who Made The Cake provided a stunning 4-layer White & Butter Cake with Amaretto Filling adorned with gray marbled fondant and gold leaf accents. The cake was further decorated with ivory roses. With the night still young, the band Electric Circus kicked off one of 3 live sets of energizing music. WBE’s Team infiltrated the gyrating crowd, passing out flashing leis, lit headgear, and Captains & Sailors hats to the partying guests. 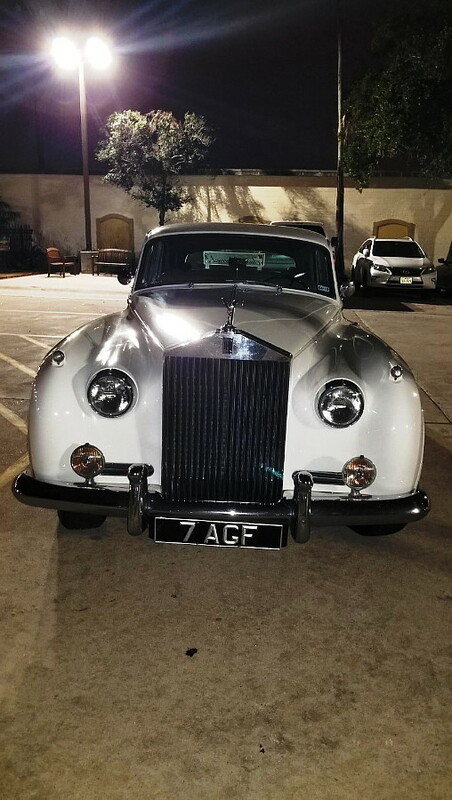 Later that night, Taylor & Noah exited to a chauffeured Rolls Royce provided by Vintage Limo Service, as celebrating guests blew bubbles. Thanks to the coordinated efforts of Dewayne and the Wedding Bliss Events Team, we were again able to Make Extraordinary Happen!